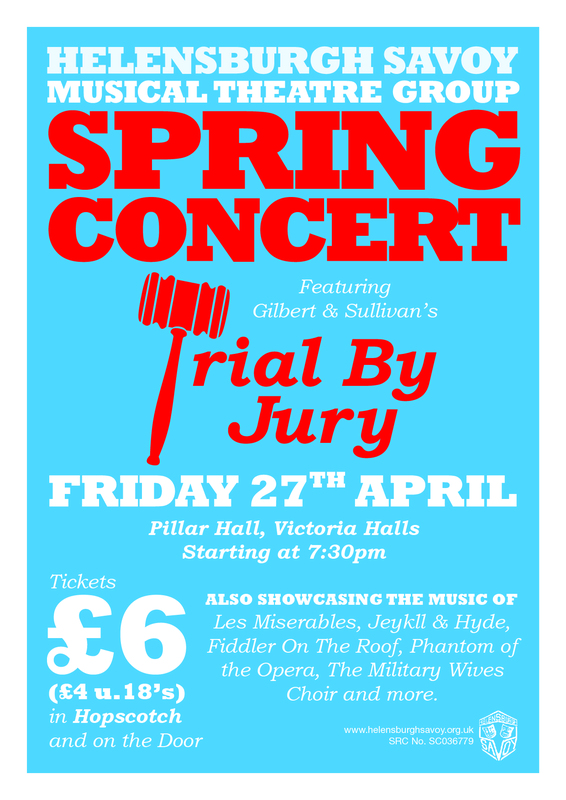 Helensburgh Savoy are pleased to announce their popular Spring Concert, this year featuring a full performance of Gilbert & Sullivan’s Trial by Jury in the first half, followed by the usual mix of songs from musicals old and new in the second half – including Les Miserables, Jeykll & Hyde, Phamton of the Opera and Fiddler on the Roof. We are returning again to last years new location of the Pillar Hall upstairs in the Victoria Halls. The concert will be on Friday 27th April, in the Pillar Hall, Victoria Halls, Helensburgh. Tickets are £6 (£4 u.18) and are available from Hopscotch and on the Door. As with last year there will be a bar available at the performance, along with a raffle.